Split the children into 4 teams and sit a team in each corner of your meeting space. Place a cone in each corner of your meeting space approx. 2 metres away from the walls. On top of each cone put a bean bag and in the middle of the room, place a skittle. 1. Number each player in the team and make sure they are sitting with their backs to the wall, so they do not obstruct players running around. 2. Call out one number at a time, when their number gets called out, the person in each team with that number needs to run around the room in a clockwise direction, outside the cones in the four corners. Once they are back at the cone they started from, they can pick up their bean bag and throw it at the skittle. 3. The first person to knock over the skittle gets a point for their team. 4. 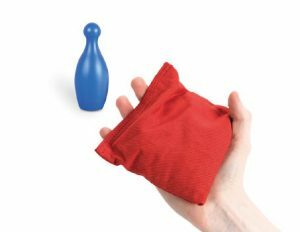 If a bean bag is thrown and it misses the target, they can collect it, return to their cone and try again.